This bag carries so much stuff and has pockets galore! 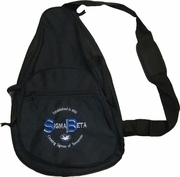 It represents Sigma Beta too! It measures 20" tall x 13" wide x 6 1/2" deep. Each Design features the "Sigma Beta Club" lettering arched above, your choice of wording for the bottom of the design, including custom lettering (up to 18 characters).